Neuropeptides are short peptides in the range of 3–40 residues that are secreted for cell-cell communication in neuroendocrine systems. In the nervous system, neuropeptides comprise the largest group of neurotransmitters. In the endocrine system, neuropeptides function as peptide hormones to coordinate intercellular signaling among target physiological systems. The diversity of neuropeptide functions is defined by their distinct primary sequences, peptide lengths, proteolytic processing of pro-neuropeptide precursors, and covalent modifications. Global, untargeted neuropeptidomics mass spectrometry is advantageous for defining the structural features of the thousands to tens of thousands of neuropeptides present in biological systems. Defining neuropeptide structures is the basis for defining the proteolytic processing pathways that convert pro-neuropeptides into active peptides. Neuropeptidomics has revealed that processing of pro-neuropeptides occurs at paired basic residues sites, and at non-basic residue sites. Processing results in neuropeptides with known functions and generates novel peptides representing intervening peptide domains flanked by dibasic residue processing sites, identified by neuropeptidomics. While very short peptide products of 2–4 residues are predicted from pro-neuropeptide dibasic processing sites, such peptides have not been readily identified; therefore, it will be logical to utilize metabolomics to identify very short peptides with neuropeptidomics in future studies. Proteolytic processing is accompanied by covalent post-translational modifications (PTMs) of neuropeptides comprising C-terminal amidation, N-terminal pyroglutamate, disulfide bonds, phosphorylation, sulfation, acetylation, glycosylation, and others. Neuropeptidomics can define PTM features of neuropeptides. In summary, neuropeptidomics for untargeted, global analyses of neuropeptides is essential for elucidation of proteases that generate diverse neuropeptides for cell-cell signaling. Neuropeptides are utilized in the nervous and endocrine systems for cell-cell signaling to regulate cellular and physiological functions [1, 2, 3]. Neuropeptides of the nervous system function as the largest class of neurotransmitters, along with the smaller group of classical neurotransmitters (Fig. 1A) . The brain central nervous system (CNS) utilizes neuropeptides in the control of behaviors and for central regulation of neuroendocrine systems. The peripheral sympathetic and parasympathetic nervous system utilizes neuropeptides for neural regulation of target physiological organ systems. Further, endocrine hormone systems utilize neuropeptides to coordinate physiological functions in homeostasis and in responses to the environment, utilizing feedback peptide hormone systems (Fig. 1B). The global participation of neuropeptides required for cell-cell communication among all organ systems in humans and vertebrate species, as well as in invertebrate species, underscores the critical importance to define neuropeptide structures and their corresponding biological activities for regulating target cell functions. The primary amino acid sequences of neuropeptides, without and with post-translational modifications, define their bioactivities. While numerous active neuropeptide structures with physiological functions are known, the discovery of novel, previously unknown peptides with potential for bioactivities, is exploding due to advances in peptidomics mass spectrometry. High throughput analyses of hundreds to thousands of peptides have been advanced by innovative LC-MS/MS tandem mass spectrometry technology combined with peptide bioinformatics [4, 5, 6, 7, 8, 9, 10, 11, 12]. This review illustrates how neuropeptidomics is essential for elucidating proteolytic processing mechanisms that convert pro-neuropeptides into small neuropeptides of diverse structures and biological functions. Further, neuropeptidomics fosters discovery of potentially novel bioactive peptides. The expanding repertoire of active neuropeptides increases the complexity of proteolytic mechanisms that generate neuropeptides for cell-cell communication networks among neuroendocrine and physiologic systems. Diverse neuropeptide bioactivities regulate brain and physiological organ functions (Table 1). Active brain neuropeptides include the opioid peptides of enkephalin, dynorphin, and beta-endorphin that regulate analgesia and are important in chronic pain conditions [13, 14, 15]. Galanin regulates cognition in normal and neurodegeneration conditions [16, 17]. CCK (cholecystokinin)  and NPY (neuropeptide Y)  regulate feeding behavior and obesity. Calcitonin regulates calcium homeostasis  and migraine pain . Substance P participates in the regulation of pain as well as memory [22, 23]. In neuroendocrine hormone systems, neuropeptides function as peptide hormones that regulate essential physiological functions in development, growth, homeostasis, responses to environmental conditions, and related . The peptide growth hormone releasing hormone (GHRH) produced in the hypothalamus is secreted to regulate growth hormone production and secretion from the pituitary gland in the regulation of developmental growth and metabolism. Thyrotropin releasing hormone (TRH), also produced in the hypothalamus, stimulates the release of thyrotropin stimulating hormone (TSH) from the pituitary to stimulate thyroxine release of the thyroid gland to control growth, development, and metabolism. The ACTH peptide hormone, released from the pituitary gland, stimulates glucocorticoid steroid hormone secretion from the adrenal cortex. Insulin is a key peptide hormone that regulates blood sugar levels, and is a key factor in diabetes disease. Vasopressin released from the posterior pituitary regulates water balance and kidney function; vasopressin is also known as antidiuretic hormone. These examples illustrate the diverse actions of neuropeptides in the nervous and neuroendocrine systems. Neuropeptides are synthesized as inactive precursors, pro-neuropeptides, that require proteolytic processing to generate the smaller, active neuropeptides of ~ 3–40 residues [3, 25, 26]. Genetic protease knockout studies in animal model studies have shown that the cysteine proteases cathepsin L and cathepsin V, and the serine subtilisin-like proteases PC1/3 and PC2 participate in processing pro-neuropeptides at paired basic residue cleavage sites (KR, RR, RK, and KK sites) into active neuropeptides (Fig. 2A) [3, 25, 26]. These two protease pathways include subsequent peptide processing steps by aminopeptidase B (AP-B)  and cathepsin H  exopeptidases, combined with carboxypeptidase E (CPE) [3, 29], respectively. Protease gene knockout studies combined with cellular studies in model systems show that these cysteine and serine protease pathway components participate in neuropeptide production [3, 25, 26]. Significantly, cathepsin V is a human-specific protease and, therefore, represents a unique human protease mechanism for production of human neuropeptides . Cathepsin V in human neuroblastoma cells participates in the production of enkephalin and NPY neuropeptides, illustrated by gene silencing and expression of cathepsin V . Cathepsin V and cathepsin L genes are both present in the human genome [30, 31, 32, 33] as well as the primate genome , but the rodent genomes (mouse and rat, utilized for many neuropeptide studies) and those of several other mammalian genomes express only cathepsin L (not cathepsin V). Human cathepsin V and mouse cathepsin L share similar functions, as demonstrated by findings showing that expression of cathepsin V in the cathepsin L knockout mouse rescues defects in T cell function and keratinocyte proliferation [35, 36]. Human cathepsin V shares greater homology with mouse cathepsin L (74.6% identity in protein sequences) compared with its homology to human cathepsin L (71.5% identify in protein sequences). In contrast to the single mouse cathepsin L gene, the human genome utilizes the two closely related cathepsin V and cathepsin L genes for cathepsin L-like functions. Global analyses of diverse neuropeptide structures by peptidomics tandem mass spectrometry (LC-MS/MS) are essential to define the primary peptide sequences combined with post-translational modifications that define distinct active neuropeptides. Notably, high throughput peptidomics LC-MS/MS analyses are necessary to investigate the multitude of diverse neuropeptide structures that are frequently composed of hundreds to thousands of peptides in biological samples. Recent achievements in peptidomics LC-MS/MS technology are rapidly expanding the repertoire of neuropeptides with known biological activities and, importantly, are increasing discovery of novel neuropeptides that have not previously been identified. Several articles summarize neuropeptidomics research methodologies in humans, mammals, and invertebrates [4, 5, 6, 7, 8, 9, 10, 11, 12, 25, 37, 38] to advance knowledge of the structural features of neuropeptides. This review focuses on neuropeptidomics efforts that define proteolytic processing mechanisms that convert pro-neuropeptides to known neuropeptides and previously unknown neuropeptides. Proteolytic processing is essential to transform inactive pro-neuropeptide precursors into active neuropeptide regulators of biological functions. Pro-neuropeptide precursors contain active neuropeptides typically flanked by dibasic protease processing sites that are cleaved by proteases to generate neuropeptides. Within pro-neuropeptides, active neuropeptides are typically flanked by dibasic residues processing sites composed of KR, KK, RR, and RK processing sites, as well as monobasic Arg sites (Fig. 2B). Processing of pro-neuropeptides can generate multiple, related neuropeptides from a single precursor; for example, multiple enkephalin-related analgesic peptides are generated from proenkephalin (Fig. 2B (a)), and several dynorphin-related peptides involved chronic pain are generated from prodynorphin (shown in Fig. 2B (b)). Further, a pro-neuropeptide may be processed into several distinct neuropeptides of different functions (Fig. 2B (c)); for example, POMC (proopiomelanocortin) is processed to ACTH that regulates steroid secretion, β-lipotropin that is an intermediate peptide that undergoes further processing to generate the β-endorphin analgesic neuropeptides, and α-MSH (α-melanocyte stimulating factor) that regulates skin pigmentation . Some pro-neuropeptides are converted to single neuropeptide molecules, as for the production of NPY, CCK, and galanin (Fig. 2B (d, e, f)). Neuropeptidomics analyses have demonstrated proteolysis of dibasic processing sites to generate endogenous peptides (Fig. 3). Neuropeptidomics has analyzed endogenous peptides in secretory vesicles of that produce, store, and secrete neuropeptides [7, 8]. Neuropeptides of large dense core secretory vesicles, isolated from the human adrenal sympathetic nervous system, identified a multitude of peptides. Evaluation of the precursors from which such peptides were derived indicated proteolytic processing at dibasic cleavage sites (KR, KK, RK, and RR sites), illustrated by LOGO maps (Fig. 3A). These data represent prohormone cleavage sites of proenkephalin, pro-NPY, pro-SAAS, chromogranin A, chromogranin B, and secretoganin II (also known as chromogranin C) pro-neuropeptides . Novel cleavage sites of pro-neuropeptides were revealed by neuropeptidomics data and illustrated by LOGO maps (Fig. 3B). Results showed abundant cleavages occurring at glutamate and leucine at the P1 position of putative cleavage sites (cleavage site is P1-↓P1’); proteases cleaving at glutamate or leucine residues for neuropeptide production have not yet been identified. Also, cleavages at P1’ residues of serine, leucine, and glutamate were observed. These cleavage sites flank known and novel peptides within pro-neuropeptides. In addition to direct identification of endogenous peptides to analyze cleavage sites of pro-neuropeptides, bioinformatics analyses of pro-neuropeptides can be used to predict proteolytic processing sites and potential neuropeptides. NeuroPred is a tool for prediction of neuropeptides derived by proteolytic cleavage of precursor proteins [39, 40]. Such searching algorithms have been developed that analyze genomes for structural hallmarks of neuropeptides comprised of dibasic processing sites of precursors, glycine as a potential amidation site, signal peptide, and neuropeptide motifs . Neuropeptidomics results are necessary for understanding proteolytic processing mechanisms for neuropeptide production. Continued neuropeptidomics data will advance understanding of the proteolytic processing mechanisms for neuropeptide biosynthesis. Neuropeptidomics has identified known neuropeptides and previously unknown peptides derived from pro-neuropeptides. Mapping the identified peptides to their precursors illustrated the profile of endogenous peptides derived from proenkephalin, pro-NPY, pro-SAAS, as well as the granins of chromogranins A, B, and C .
Proenkephalin-derived peptides, identified by neuropeptidomics, consisted of the known (Met)enkephalin pentapeptide (Tyr-Gly-Gly-Phe-Met) (ME), (Leu)enkephalin (Tyr-Gly-Gly-Phe-Leu), and the extended peptides ME-Arg-Gly-Leu and ME-Arg-Phe (Fig. 4). Further, intervening peptide sequences located between the enkephalin domains were identified, indicating discovery of new peptide products (Fig. 4). The presence of intervening peptides was enhanced by digestion with trypsin or V8 protease (Fig. 4). Peptides derived from pro-NPY identified by neuropeptidomics illustrated peptides spanning the NPY domain and the C-terminal domain (Fig. 5) . Multiple peptides spanned the NPY of 36 residues. Peptides representing the C-terminal peptide domain were identified, which indicated cleavage at a monobasic Arg residue and several other cleavage sites. These data were obtained from undigested, trypsin-digested, and V8 protease-digested conditions. The presence of pro-neuropeptide derived intervening peptides and active neuropeptides indicates the potential explosion of peptide discovery by neuropeptidomics. Future investigation of the newly discovered peptides for biological functions will expand the diversity of active neuropeptides. 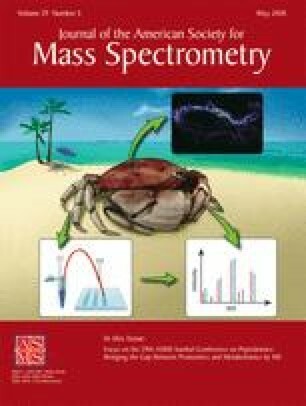 A notable limitation of LC-MS/MS methods is that very short neuropeptides of 2–4 residues have not been readily identified, although many short peptide mass spectra are available in the NIST17 mass spectral library . The presence of such very short neuropeptides in biological samples is expected, since very short peptide products of 2–4 residues are predicted from pro-neuropeptides processing at paired basic residue cleavage sites. Identification of very short peptides has encountered bioinformatics challenges since the probability of false positives increases as peptide sequence length decreases . Therefore, very short peptides will be intrinsically more difficult to identify based on probability. Significantly, metabolomics strategies may be ideally suited to identify and quantify very short peptides, based on their low molecular weight and more hydrophilic nature suitable for metabolomics. As example, TRH is an active neuropeptide composed of the tripeptide Gln-His-Pro that undergoes pyroglutamate and amidation modifications to generate active TRH of pGlu-His-Pro-amide . TRH has been identified by GC-MS (gas chromatography mass spectrometry) , a mainstay methodology for metabolomics analyses of small molecules. Bioinformatics and metabolomics analyses can be used for analyses of very short peptides derived from pro-neuropeptides. As example, bioinformatics analyses show that very short di-peptide, tripeptide, and tetra-peptides, as well as longer peptides, are predicted to be generated from the NESP55 protein by processing at diba sic cleavage sites. Metabolomics analyses of these very short peptides should be compared to peptidomics LC-MS/MS analyses to advance identification and quantitation of short peptides. Such short peptides are predicted to possess biological activity since NESP55 regulates impulsive behaviors and genomic imprinting, demonstrated by NESP55 gene knockout studies . Importantly, understanding the diversity of active neuropeptides will be enhanced by combining metabolomics and neuropeptidomics analyses with interrogation of biological functions mediated through receptor mechanisms. Neuropeptide primary sequence structures frequently undergo post-translational modifications (PTMS) that modify bioactivities of peptides. Peptide PTMs include C-terminal amidation, N-terminal pyroglutamate, disulfide bonds, phosphorylation, sulfation, acetylation, glycosylation, and others. The PTMs together with proteolytic processing of pro-neuropeptides generate bioactive peptides. C-terminal amidation and N-terminal pyroglutamate modifications occur after proteolytic processing of pro-neuropeptides [46, 47]. The disulfide peptide bonds of insulin occur at the proinsulin stage prior to proteolytic processing . However, it is not yet entirely known whether the PTM events of phosphorylation, sulfation, acetylation, and glycosylation are present on the pro-neuropeptide, or if these modifications occur after proteolytic processing. Significantly, development of neuropeptidomics strategies to define both primary sequences and PTM features of neuropeptide structures will be necessary to understand mechanisms of proteolytic and covalent modifications of neuropeptides. Several pro-neuropeptides that undergo PTM alterations for neuropeptide production are described here. The POMC precursor is a pro-neuropeptide that undergoes numerous post-translational modifications (PTMs) consisting of proteolysis, acetylation, amidation, phosphorylation, glycosylation, and disulfide linkage to generate mature peptides [49, 50, 51, 52]. The TRH (thyrotropin releasing hormone) tripeptide is modified by N-pyroglutamate and C-terminal amidation . Mature insulin contains disulfide linkage of its peptide domains; disulfide formation of proinsulin occurs prior to proteolytic processing . Biological forms of CCK neuropeptides include sulfation . Other types of peptide PTMs include palmitoylation  and sulfotyrosine modifications [55, 56], but these have been difficult to identify. Numerous neuropeptides with PTMs function as signaling molecules in cell-cell communication. Coordinate Regulation of Families of Related Neuropeptide Molecules in Biological Systems. Proteolytic processing of pro-neuropeptides results in families of related neuropeptides that are often coordinately regulated in physiological functions. As example, regulation of blood pressure is achieved with a family of vasoactive neuropeptides that include angiotensin, bradykinin, vasopressin, and related peptides. Angiotensin I, angiotensin II, bradykinin, and kallidin neuropeptides undergo changes in plasma levels in response to administration (to rat) of an inhibitor of the angiotensin converting enzyme (ACE), known as captopril. ACE converts angiotensin I to angiotensin II which elevates blood pressure. Captopril blocks the formation of angiotensin II and in parallel also regulates bradykinin and kallidin in a temporal fashion (Fig. 6) . Neuropeptidomics can assess the concurrent changes of neuropeptide profiles in response to drug modulator and during different biological conditions. Neuropeptidomics analyses of human plasma will be valuable to define the changes occurring in neuropeptide profiles that participate in regulating neuroendocrine systems. Neuropeptidomics will advance understanding of cell-cell signaling mechanisms, biomarkers of disease conditions, and neuropeptides as drug targets for discovery and development of new therapeutic agents. Investigation of human systems with model vertebrate and invertebrate organisms together will promote elucidation of human neuropeptide functions in neuroendocrine systems. Further, peptide signaling mechanisms in human cellular models of patient-derived induced pluripotent stem cells (iPSC) neurons and cell types  can be elucidated through neuropeptidomics. Future human neuropeptidomics research is expected to undergo accelerated expansion to understand human health. This work was supported by grants from the National Institutes of Health (NIH) to V. Hook (R01 NS094597, R01NS094597-S1) and to O. Fiehn (U24DK097154). C. Lietz was supported by NIH T32MH019934 (awarded to Professor Dilip Jeste, Univ. of Calif., San Diego).